Crispy Coconut Fish Fillet – Axelum Resources Corp.
Preheat oven to 450F. Spray a large baking pan with baking spray (or you can grease it with 1 teaspoon of olive oil or vegetable oil). Arrange the fish fillets on the pan. In a small bowl combine the yogurt, coconut milk and 1/4 teaspoon of the salt. Measure 4 tablespoons of this sauce into a separate small bowl. Brush the 4 tablespoons of sauce onto the tops of the fish fillets. To the remaining bowl of sauce add the cilantro and lime juice. Cover and refrigerate. In a small bowl combine the panko, sweetened coconut, coconut oil and remaining 1/4 teaspoon of salt. Sprinkle 1/4 of the crumbs down the middle of each fillet and then use your fingers to flatten and spread it, coating the top of each fillet. Bake until well browned and cooked through, 10-12 minutes. Meanwhile, to the remaining bowl of yogurt sauce add the cilantro and lime juice. Stir. 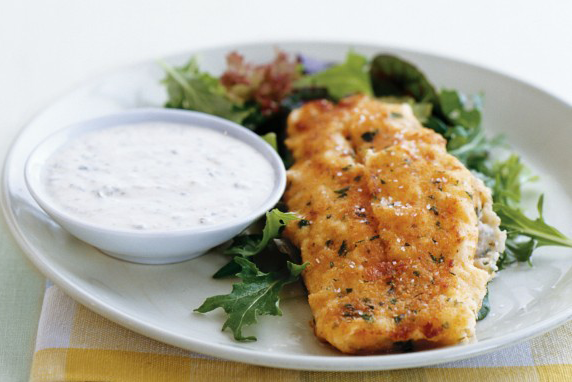 Serve the fish with the cold yogurt sauce on the side.